Children's books are often hailed for the quality of their stories or images. But we will not talk merely about stories or images now. In fact, there is a special category of books that I want to recommend. Books that are exceptional - not because they are the brainchild of a phenomenal author and illustrator of children's books. The author of this book undoubtedly shares great images and great stories - but he has even better ideas. Yet, as quirky as his books are, they are also so very realistic. They will make you shiver a bit inside. No, its not fright. Its your imagination giving you the shivers. This children's book author always add an unexpected twist to an already strange and puzzling situation. Yes, you guessed it my friends. I am talking about Chris Van Allsburg. One of America's most innovative children's book authors and illustrators. 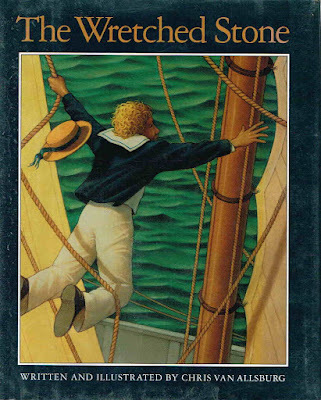 This picture book - The Wretched Stone may not be his most famous, but it is very special for the message that it conveys and because it is a perfect example of the Van Allsburg allure. The Wretched Stone contains a lesson that we often try to teach our kids, but we repeatedly fail in our warnings. Chris Van Allsburg manages to do it - by not even mentioning the topic. It is a testament to Chris Van Allsburg's massive talent. But what is this lesson, you ask? Van Allsburg's books have a sort of an ethereal quality to them. 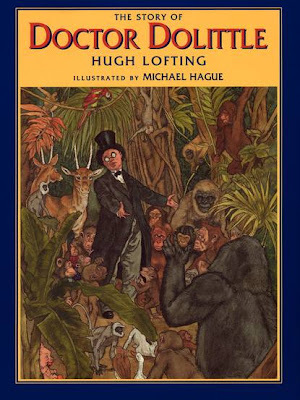 They are clearly products of the time when they were created - but unlike most shot-lived picture books, they remain timeless for every generation of children that take them into their hands. The fable is always original and concise, while the pictures are mysterious and have a clean, almost computer animated feel to them. However, the stories and the pictures do not explain what is so unique in Van Allsburg's creations. They are visions of alternate realities. Van Allsburg's picture books are an exercise of lateral thinking in a mundane day-to-day world. Since I laid my hands on the first Van Allsburg book, I simply could not stop. How can you expect a child to think out of the box, if you never let him look out over the edge? Children do look out of the box all the time. They are born as lateral thinkers. They do not approach any problem with the same inbuilt training that society instilled into us. It is we adults, who desperately try to be creative in our lives and our professions. But children ARE creative, by definition. We can only envy them and the effortless way in which their minds overcome barriers in thinking - because their minds do not see barriers in the first place. Several years ago I became worried that as my twins grow up they would lose this in-built creativity forever. The world we adults created works against our very children. So ... I knew I had to tilt the creativity balances back into their favor. And what better way than by stimulating their brains with unique books such as Van Allsburg's creations - to help children to see the amazing in the mundane. Our role as parents must be to challenge children with books that don't offer answers, but questions. Van Allsburg is - to quote Winston Churchill - "a riddle, wrapped in a mystery, inside an enigma; but perhaps there is a key." I do a great deal of work with young children, and if you give a child a problem, he may come up with a highly original solution, because he doesn't have the established route to it. I still have not mentioned the message in this book. But I will come to it. Captain Randall Ethan Hope of the Rita Anne takes us aboard his ship that is embarking on a new voyage after bringing together a "fine crew" of accomplished sailors and officers. In fact the crew has numerous readers and musicians, as well as storytellers and entertaining singers and dancers. One day, though the clear air, a little island is spotted in the distance just before the evening. An island that is missing from the nautical maps. The captain and the crew disembark the next day seeking fresh fruit and aiming to replenish the ship's water supplies, but are shocked the find out that there is absolutely no sign of animal life, not even insects. As for the plants, none of them bear fruit and even the water they find flowing is too bitter to drink. Yet, that is just one part of the find. Captain Hope and his men find a rock - and let me be precise here - approximately two feet across, with a rough texture and grey in color, but a part of it is flat and smooth - like glass. "From this surface comes a glowing light that is quite beautiful and pleasing to look at," Hope explains before instructing his crew to continue their voyage. But immediately after the extraordinary find is brought on board, things start to change. The crew starts spending more and more time looking at the stone and abandoning their duties. A strange atmosphere descends over the ship as the crew members stop speaking among themselves and shrieks can be heard at night. The captain is surprised to find that the entire crew turned into hairy apes while gazing at that terrible rock below deck, which practically spells disaster for the Rita Anne that is battered to pieces by a terrible storm. The glowing rock goes dark after the storm and the captain manages to revive his mentally dead crew by reading aloud to them and playing the violin. After the men recover completely, the captain decides to get rid of the glowing rock once and for all. Although Van Allsburg's picture book The Wretched Stone never specifically mentions the TV, clearly, the glowing rock is a symbol of the power that television has over people's lives and how it can make us descend to an almost ape-like stupor. I love it that the book does not explicitly allude to it. We never even see the glowing rock. But this makes the rock's power even more frightening. My twins guessed what the rock was supposed to stand for (with a little help) several years ago, when we read it for the first time. Three years later, we read it last night again, I was surprised to see that they knew exactly what was the wretched stone. It sometimes takes subtlety to make a point forever.